High gloss, PU alkyd resin-based white enamel. Free of aromatic hydrocarbons and in compliance with EU DecoPaint Directive (VOC). Excellent yellowing resistance. White enamel/top-coat lacquer for high-quality coatings on wood, metals and unplasticized (rigid) PVC, exteriors and interiors. Do not use on heating systems. Due to a typical odour of alkyd resin varnishes (alkyd enamels), it is advisable to use Capacryl PU-Gloss for coatings on large, seamless interior surfaces instead. 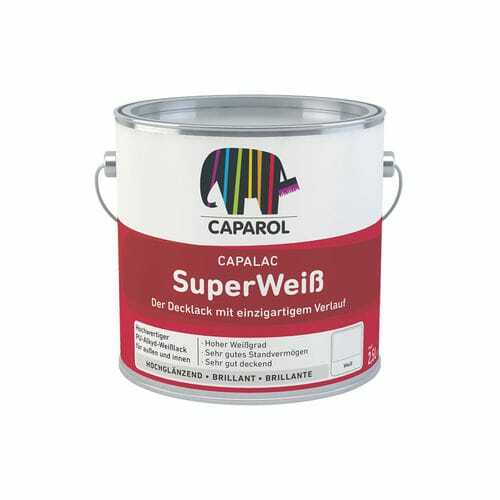 Complies with the requirements of EU DecoPaint Directive/Regulations (VOC). High covering power on edges. Resistant to common household cleaning agents (detergents) and short-term resistance against weak acids and alkalis. High weather resistance and lightfastness.